Hi guys! I wanted to try out doing a lifestyle type post on the weekends, to vary my content and have the chance to show you some new places to go etc. 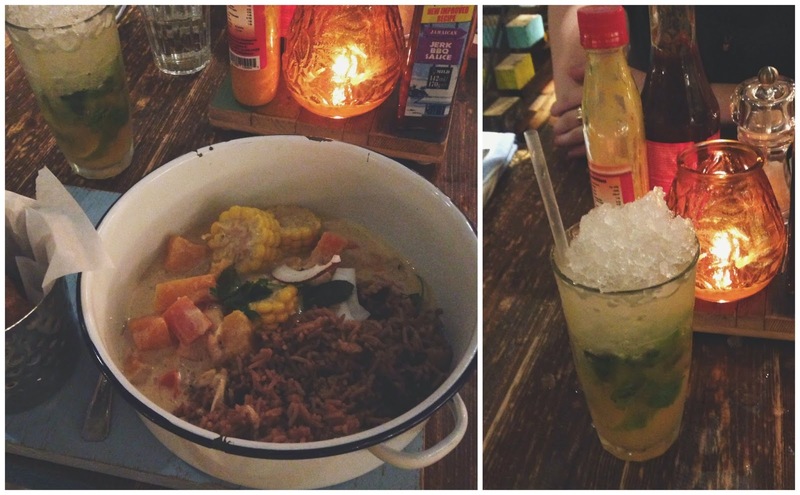 I recently went to Turtle Bay in Manchester for tea and it was so lovely that I knew it'd be perfect for my first lifestyle post! Turtle Bay has restaurants around the UK, and it's basically Caribbean food, curries, wraps etc - something to appeal to everyone! The interior of the restaurant is absolutely beautiful, really going with the Caribbean theme with wooden tables and worktops, dimmed lighting and little extras such as fairy lights and surf boards really making it authentic. Even the food is served on little wooden boards (as you can see a bit on the first picture!). First of all, I would definitely recommend going before 7pm, to take advantage of 2 for 1 cocktails! We went for the vanilla and passionfruit mojito - as heavenly as it sounds - which was super refreshing. Foodwise, I went for the 'Rastafari Run Down' curry which is vegetarian and has brown rice with sweet potato, corn, butter beans, carrots etc with the most beautiful sauce, which is also not too spicy for anyone who isn't a fan of super spicy curries! It was absolutely huge too, so for £9.65, I was really impressed - the service was so quick too, we literally had to wait about 10 minutes! If you're in the area of a Turtle Bay, I'd definitely recommend giving it a go - I'm sure you won't be disappointed! We went on a weekday evening and it was pretty quiet, but I would imagine it gets busier at weekends, but you can book a table here. The full menu is here, which includes lighter meals for lunchtimes, along with all their curries etc. Any more recommendations for places to eat in Manchester would be greatly appreciated!